Lehi: Amy Ballard, Anna Martin, Abigail Gray, Charity Clark, Olivia Burnham. Mountain View: Helena Miyazawa, Kelsi Lindley, Lyndee Hereford, Makenzi Smith, Aspen Fraughton, Ashley Faragher. Orem: Taye Raymond, Lauren Merrill, Emma Reeves, Kimmie Winward, Megan Riley, Addi Johnson, Maia Vakaafi, Emma Monsen, Gracyn Matthews. Payson: Rebecca Hazelett, Kari Evans, Mary Rickman. Salem Hills: Madeline Pruden, Brinley Michelsen, Brooke Vance, Hailee Oldroyd, Keanna Vaitohi, Paisley Ballard, Eliza Lindstrom, Emily Parrish, Jennah Lee, Aubrey Tasker, Leah Rickenbach, Courtney Smith, Emily Stevens, Kosha Roundy, Kelsey Parcell, Alexia Rosenberg. Spanish Fork: Courtney Davis, Kimball Clements, Lavinia Iketau, Jessi Mangum, Nia Iketau, Jessica Whittaker, Emma Burnham, Addison Urmston, Bayleigh Redd, Kennedy Ballard, Willow Park. Uintah: Kyla Johnson, Shaylee Avila, Rachel Slaugh, Whitney Walk, Emberli Fairey, Rylie Dutson, Rylee Dansie, Lauren Davis. Team Preview: Salem Hills, the defending region champs from last year returns a lot of its key scores from last season that put them on top of the region. Although Salem won regions last year, they finished 6th at State behind Orem (3rd), Mountain View (4th), and Lehi (5th) all of whom are in the same region. Salem's strength will come from its field athletes, Mountain View from its distance, and Orem from its Sprints. Lehi has one of the top sprinters in the State with Amy Ballard and the current Overall XC State record holder, Anna Martin. 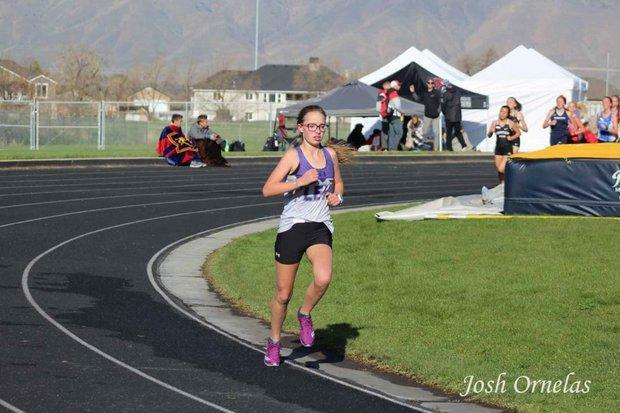 Individual Preview: The face of Region 10 will be Anna Martin of Lehi who is the defending State Champion in the 3200m and has the fastest returning overall time of 10:45.01 which puts her ahead of the entire State! Martin qualified for Footlocker Nationals this past fall after setting a new state record at the cross country meet. She is only a junior which makes her accomplishments all the more impressive. You also have Helena Miyazawa who qualified for Nike Cross Nationals and has a returning 3200m time of 10:55.96. Also look out for Amy Ballard of Lehi who has the fastest returning time in the 100m, Taye Raymond of Orem who has the top returning mark in the long jump, and Rebecca Hazelett of Payson who has the top returning mark in the Shot Put.